The South Dakota Chorale has been nominated for a Grammy Award for Best Choral Performance for its latest recording, Tyberg Masses. Other nominations associated with this recording include Best Surround Sound Album, Best Engineered Album, Classical, and Producer of the Year-Classical for Blanton Alspaugh of Sound Mirror in Boston. The Recording Academy released its list of award nominees today, and the Grammy Awards will be presented January 28, 2018. The music of Marcel Tyberg has only recently been rediscovered. Tyberg, a church musician and composer, was killed in the holocaust. At his death, his music was entrusted to friends who brought it to the United States where it was rediscovered by JoAnn Falletta of the Buffalo Philharmonic. Several orchestral pieces have been performed and recorded, but the South Dakota Chorale’s concerts and recording are the first time the choral works have been heard since Tyberg’s death. The South Dakota Chorale performed this music in concert in Sioux Falls, Minneapolis, Lincoln, NE and Durham, NC. The recording was made at First Plymouth Congregational Church in Lincoln, NE. 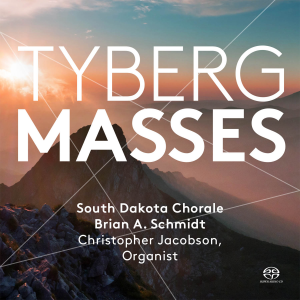 Tyberg Masses, is the third commercial recording made by the South Dakota Chorale since its inception in 2009. Other notable performances include an appearance at the National Conference of The American Choral Directors Association in Salt Lake City in 2015, and at the Iowa Choral Directors Summer Conference in 2016. The South Dakota Chorale is a professional choral organization based in Sioux Falls, South Dakota. It is under the direction of Dr. Brian Schmidt, who is currently Associate Professor of Choral Music at Baylor University. Dr. Schmidt is a Minnesota native who did his undergraduate study at South Dakota State University. The Chorale’s mission is to bring people together to produce inspirational world-class performances of choral arts that embrace professional artistry and enrich the cultural life of South Dakotans. Singers from this area are joined by other professionals from around the country. In addition to concerts and recordings, the Chorale regularly partners with area schools to give young singers an awareness that there are opportunities for choral singing beyond their high school and college experiences. For more information about the the South Dakota Chorale, visit http://www.southdakotachorale.com/ or contact Jack Mohlenhoff, Executive Director at jmohlenhoff@firstcongucc.com or 605.359.1058.